বায়ুমণ্ডলে ওজোনের প্রায় ৯০ শতাংশ স্ট্রাটোস্ফিয়ারের মধ্যে অন্তর্ভুক্ত করা হয়। ওজোন কেন্দ্রীকরণ প্রায় ২০ এবং ৪০ কিলোমিটার (৬৬,০০০ এবং ১৩১,০০০ ফুট), তারা যেখানে মিলিয়ন প্রতি প্রায় ২ থেকে ৮ অংশ থেকে পরিসীমার মধ্যে সর্বশ্রেষ্ঠ হয়। যদি এই ওজোনের সবটুকু অংশ সমুদ্রতল এর বায়ু চাপ দ্বারা সংকুচিত করা হয় তাহলে এটি শুধুমাত্র ৩ মিলিমিটার (১/৮ ইঞ্চি) পুরু হবে! Sei John H.; Pandis, Spyros N. (1998). Atmospheric Chemistry and Physics: From Air Pollution to Climate Change. John Wiley and Sons, Inc. আইএসবিএন ০-৪৭১-১৭৮১৬-০. NASA. Studying Earth's Environment From Space. June 2000. (accessed November 3, 2010) https://web.archive.org/web/20160702015844/http://www.ccpo.odu.edu/~lizsmith/SEES/index.html. Levels of ozone at various altitudes and blocking of different bands of ultraviolet radiation. Essentially all UVC (100–280 nm) is blocked by dioxygen (from 100–200 nm) or else by ozone (200–280 nm) in the atmosphere. 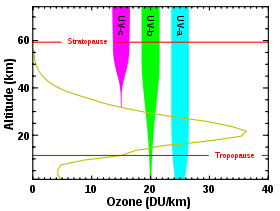 The shorter portion of the UV-C band and the more energetic UV above this band causes the formation of the ozone layer, when single oxygen atoms produced by UV photolysis of dioxygen (below 240 nm) react with more dioxygen. 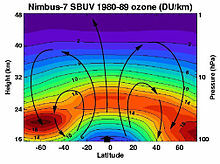 The ozone layer also blocks most, but not quite all, of the sunburn-producing UV-B (280–315 nm) band, which lies in the wavelengths longer than UV-C. 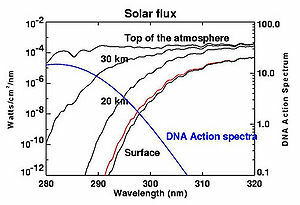 The band of UV closest to visible light, UV-A (315–400 nm), is hardly affected by ozone, and most of it reaches the ground. UVA does not cause skin reddening, but there is evidence that it causes long-term skin damage.